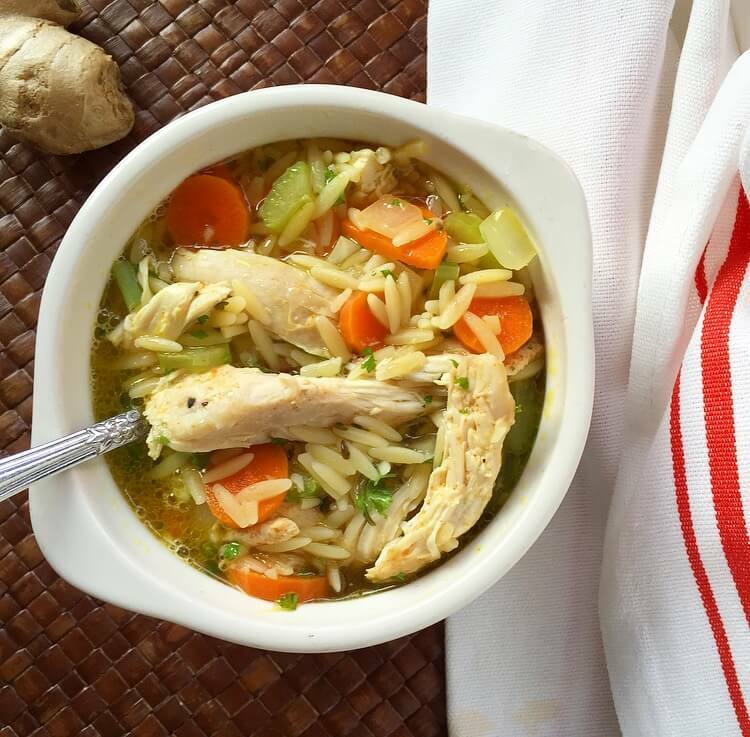 This chicken noodle soup has lemon, ginger and turmeric to give it an extra punch. All of these ingredients have so many health benefits and promote a healthy immune system. The orzo pasta is a fun change from normal chicken noodle soup. Even if you are not getting sick, making a batch of this soup will just make you even more prepared for winter! Preheat the oven to 375F. Season the chicken with salt, pepper and garlic. Bake chicken at 375F until cooked through, about 30 minutes. While the chicken is cooking, cook the orzo pasta according to the box directions. You will want to pull it a couple minutes early so that it doesn't get overcooked in the soup. In a large saucepan, heat the olive oil over medium heat. Add the onion and sauté until fragrant. Add the garlic, ginger and turmeric. Cook for an additional minute or two. Add the parsley and chicken stock and bring to a simmer. Shred the cooked chicken. Add the chicken and orzo to the broth to serve.